I have another album of photos from my recent trip to France, with a link in the side bar (removed from the sidebar for Lent -- see album here). This album is from the Sacré-Coeur Basilica at Paray-le-Monial, with one photo of the adjacent Cloister Garden. Click on a photo to enlarge it, and follow the "next" link to move from photo to photo if you wish. Photography was not allowed in the Chapel of the Apparitions, at the nearby Convent of the Visitation, so there are no photos from there. All that is beneath Him does not suffice for us. "We need to have knowledge of the littleness of creatures and to hold as nothing everything that is made, in order to love and have God that is unmade. For this is the cause why we be not all in ease of heart and soul: that we seek here rest in those things that are so little, wherein is no rest, and know not our God that is All-mighty, All-wise, All-good. For He is the Very Rest. God wills to be known, and it pleases Him that we rest in Him; for all that is beneath Him does not suffice for us. And this is the cause why no soul is rested till it is made nothing as to all things that are made. When it is willingly made nothing, for love, to have Him that is all, then is it able to receive spiritual rest." - Dame Juliana of Norwich, Revelations of Divine Love (long text), First Revelation, Chapter V, modified from John Ockerbloom's translation in Christian Classics Ethereal Library. The word translated "nothing" here, following a modern English translation, is rendered "nought" by Ockerbloom, with a note explaining that Juliana's 14th century English is "nowtid of," and that it was rendered as "naughted" (emptied) by Julian's first editor Seranus de Cressy, whose 1670 edition still exists. Carmelites may think of St. John of the Cross and his "nada." Here is a link to a biographical post About Bl. Julian of Norwich. This is a travel video of l'Abbaye de Fontenay, a beautiful abbey founded by St. Bernard in 1118. Today is the memorial of St. Bernard of Clairvaux, the twelfth century Mellifluous Doctor of the Church known as the last of the Church Fathers. "He to whom there is no need to say anything knows what we desire (Wis. 7:27, Mt. 6:8). We know that he can do everything. . . . It is enough for us to have brought his power here, to have given his holiness a reason, and we prefer to wait patiently upon his will rather than impudently to ask what he will not perhaps wish to do. Perhaps what our deserving lacks our modesty will supply?" - St. Bernard of Clairvaux, an excerpt from On Humility and Pride, as translated by G.R. Evans in Bernard of Clairvaux: Selected Works , Classics of Western Spirituality series. Sandro Magister today provides what he calls some Summer Reading about the 800 martyrs of Otranto, whose memorial is today. They died on August 14, 1480, defending Italy against an invasion by the Ottoman Turks. After conquering Constantinople, the Turks landed in Italy and attacked the easternmost city of Otranto in the course of their ambition to conquer Christian Europe. The city's two-week resistance is seen by historians as key to defending southern Italy, allowing the city of Naples enough time to prepare for the ensuing attack. "My brothers, until today we have fought in defense of our homeland, to save our lives, and for our earthly governors; now it is time for us to fight to save our souls for our Lord. And since he died on the cross for us, it is fitting that we should die for him, remaining firm and constant in the faith, and with this earthly death we will earn eternal life and the glory of martyrdom." "Otranto teaches us that a culturally homogeneous civilization – or even one predominantly animated by realistic principles – is capable of reacting in a substantially unified manner in defense of its own peace, and can do this without trampling upon its own identity and dignity." Also see the video of Saint Pierre de Moissac of the Cluniac monks here, which I cannot embed. The 3 lower windows and the royal portals beneath them, shown in the next video of the west wall of Chartres Cathedral, date back to the mid- twelfth century. The rose window above them is more recent, as is most of the present building. Carmen's previous books include a simple and readable, and also very informative, biography titled Man of Blessing: A Life of St. Benedict and a collection of inspirational readings titled Incandescence: 365 Readings with Women Mystics . About Blessed John Duns Scotus - A biographical sketch. Quote from Bl. John Duns Scotus on Truth. Reflections on John Duns Scotus - Reflections on his life, the quote linked above. About Blessed Julian of Norwich - This biographical sketch of the 14th century English anchoress mentions the possible influence of Bl. John Duns Scotus on her writings. Quote from Bl. Julian of Norwich reminiscent of the thinking of John Duns Scotus. In the Hail Mary, take for your foundation "Jesus"
When you say the 'Our Father,' take for your foundation 'Thy will be done.' In the 'Hail Mary' take 'Jesus'; let Him be ever fixed in your heart and He will be your guide and shield in the course of life in all your needs. In Holy Scripture take 'Love,' with which you will ever go straightly, exactly, lightly, attentively, swiftly, enlightenedly, without error, without guide, and without the means of other creatures, since Love is sufficient for itself to do all things without fear or weariness, so that martyrdom itself appears a joy." - St. Catherine of Genoa, The Three Rules of Love, Ch. VI, from The Life and Sayings of Saint Catherine of Genoa, anthology and commentary by Paul Garvin, Alba House, 1964. September 15 is the memorial of St. Catherine of Genoa and is also the Feast of Our Lady of Sorrows. From last year, here is a biographical post "About St. Catherine of Genoa." Women for Faith & Family has a History of the Devotion to Our Lady of Sorrows, together with readings and a sequence hymn in Latin and English. Click on photo twice to see photo full sized. 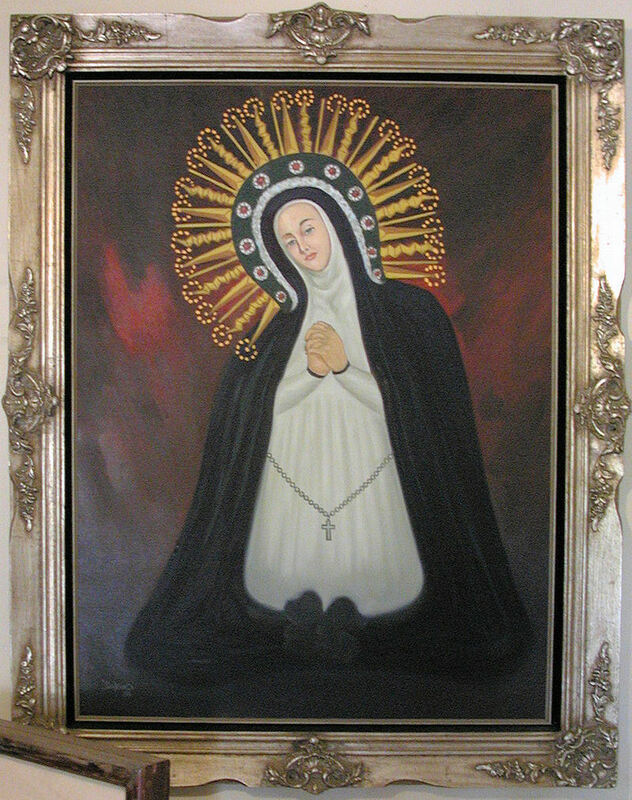 Photo credit: Simondi, Thomas E. "Our Lady of Sorrows", period piece from Mission Soledad Church, from the Mission Tour Website, http://missiontour.org/index.htm, (September 10, 2006). Photo used with the permission of Thomas E. Simondi.